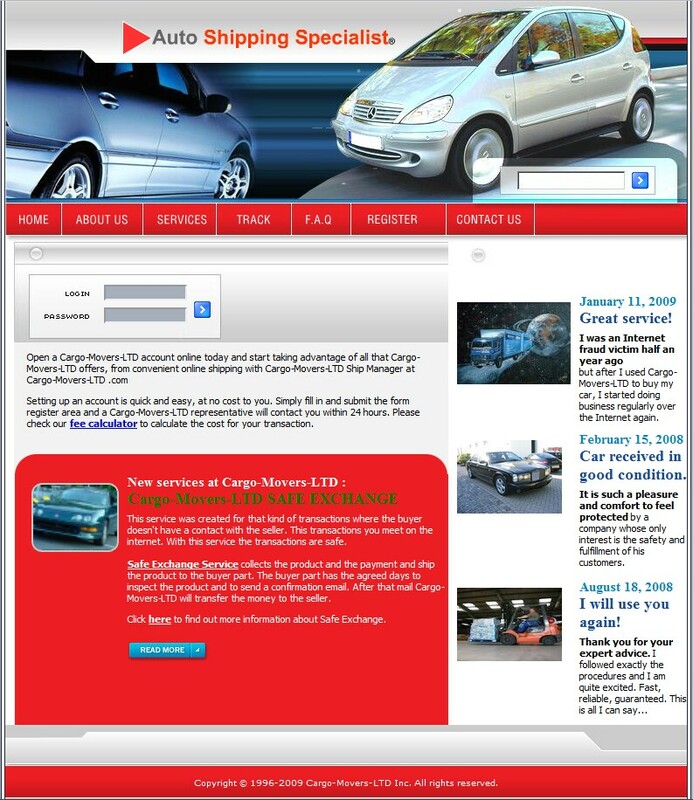 The site is currently being used to defraud Craigslist buyers. 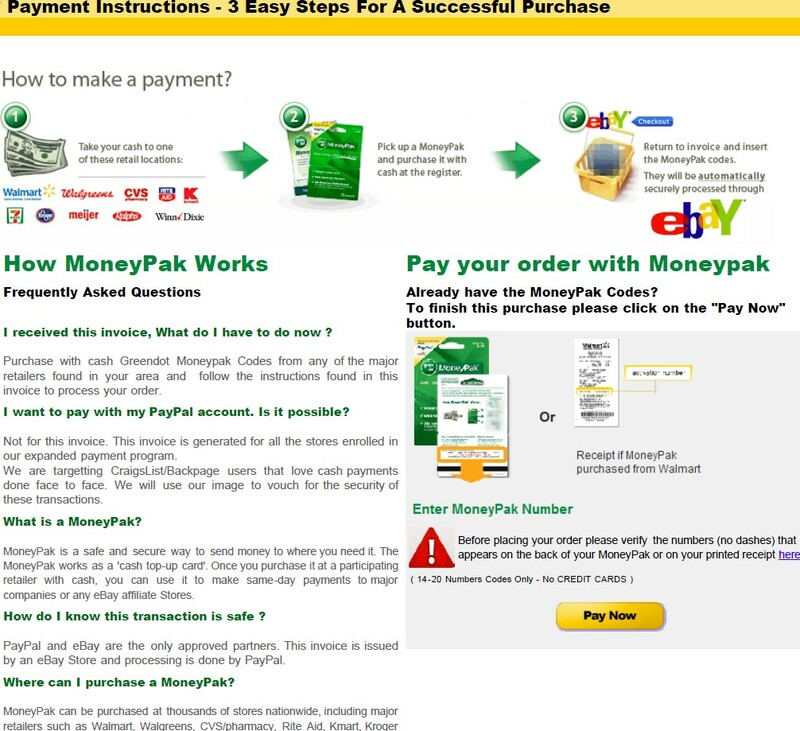 NEVER use instant payment services like MoneyGram or Western Union to make internet purchases. Those payment methods offer no security to the sender. Once the money is picked up it can never be recovered. The scammers are sending invoices in the form of a PDF file. Please make payment within 2 days after purchase. 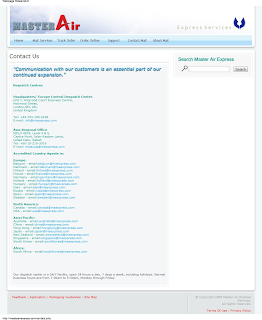 We do not guarantee product availability if payment is not received within this period. 1. Buyer and Seller Agree to Terms. inspection, and any shipping information. 2. 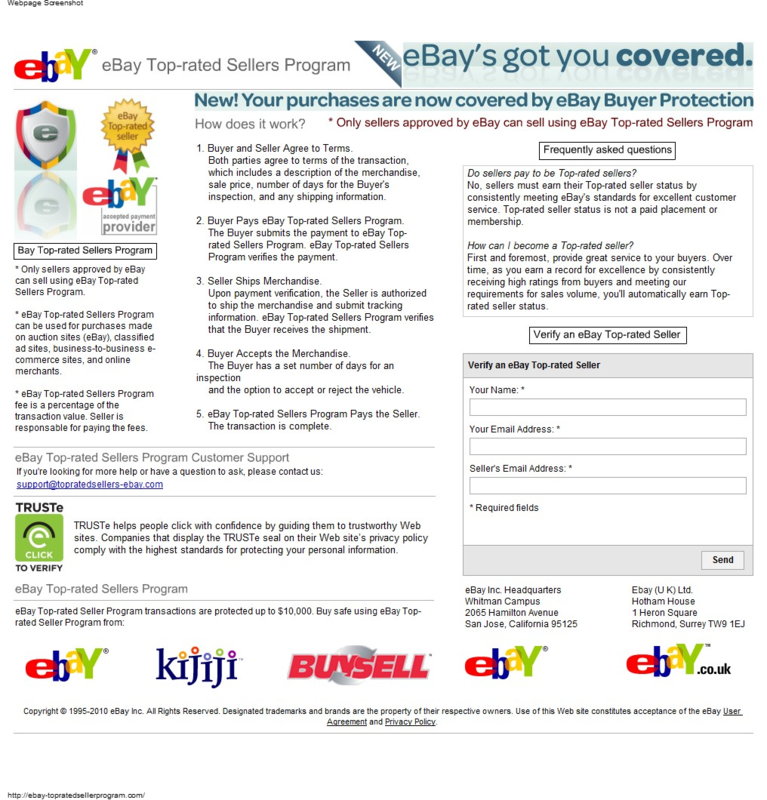 Buyer Pays eBay Top-rated Sellers Program. that the Buyer receives the shipment. 4. Buyer Accepts the Merchandise. and the option to accept or reject the vehicle. 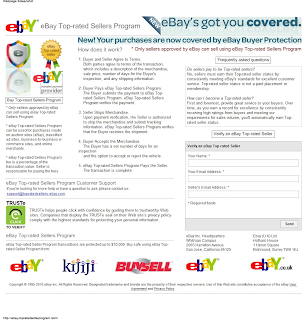 5. eBay Top-rated Sellers Program Pays the Seller. Please contact ebay top rated seller aat this email : topratedseller@representative.com and they will send you all the information that you need . 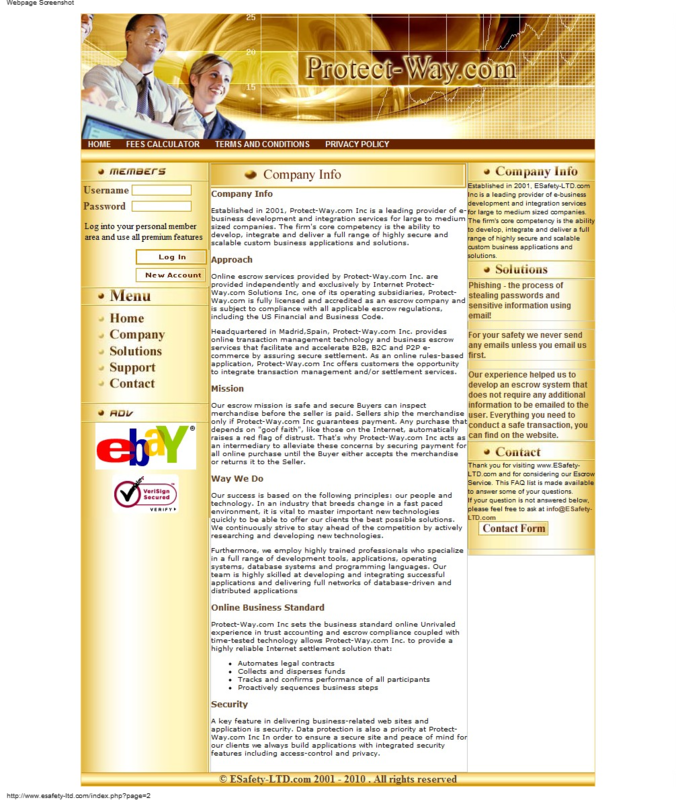 I use ebay because is 100 % safe for seller and buyer . Payment is not made through Western Union or Money Gram and this provides both buyer and seller safety. 1. You'll send to eBay Top-rated Seller Program and deposit of C$ 3000 and rest when you receive the car. I do not accept payment through Western Union or MoneyGram. 2. They will secure your money and contact me to start the shipping. 3. I will start the shipping and I will email you the tracking number in the same day. 4. 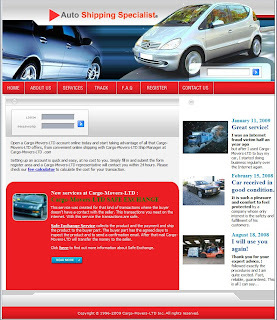 You will receive the car and you'll have 14 days to inspect it before take any decision. just ask eBay for full refund. And the shipping company will pick up the car from you. want it after inspection, no need to pay the ship back fees. Let me know if you agree and let's move to the next step. 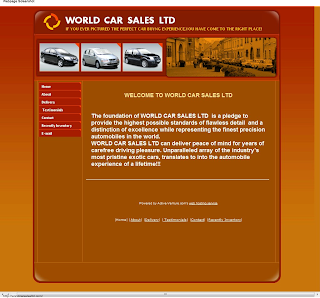 The scammer is listing cars for sale on the internet and asking for wire transfer payments to banks in the UK. 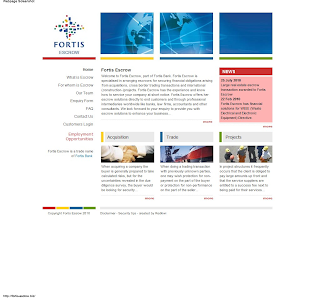 The site is being hosted in Russia. 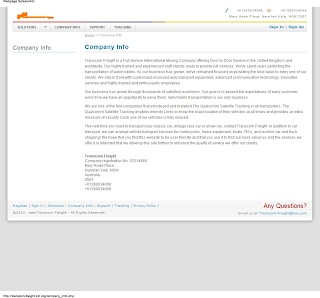 The scammer's use of this template caused the company BuyerGuardian.com to go out of business in 2008. Both parties agree to terms of the transaction, which includes a description of the vehicle, sale price, number of days for the Buyer's inspection, and any shipping information. Either the Buyer or Seller signs in to Central SafePay and creates a transaction. If either the Buyer or Seller is not a registered user, they must register with Central SafePay. Registration is free. The initiating party confirms the information entered, and agrees to the escrow instructions. 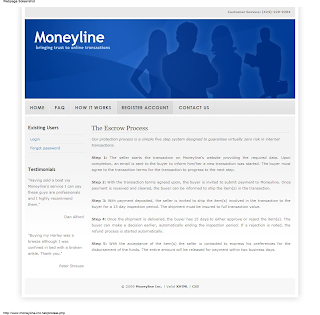 The other party is notified by e-mail, to sign in and agree to the terms of the transaction provided by the initiating party. After both parties have agreed to the terms, the Buyer will be asked to submit payment to Central SafePay. The Buyer submits an available payment option. Central SafePay verifies the payment. Processing time varies by payment method. When payment is received, it will be verified and secured into a non-interest bearing trust account. After payment is secured, the Seller is notified by Central SafePay to ship the vehicle to the Buyer. 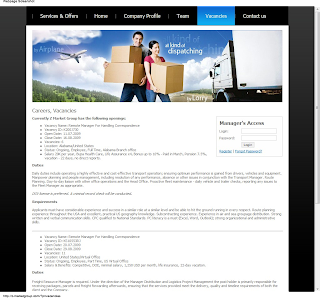 Upon payment verification, the Seller is authorized to ship vehicle and submit tracking information if available. Central SafePay verifies that the Buyer receives the shipment. The inspection period will not begin until Central SafePay has confirmed delivery of the vehicle or the Buyer marks the vehicle as received on the transaction screen. The Buyer has a set number of days for an inspection and the option to accept or reject the vehicle. For more information, FAQs - Return Questions. When the Buyer accepts the vehicle or the inspection period expires (at which point, the Buyer automatically accepts), the disbursement of payment will begin. Please note that Central SafePay may perform additional verification before funds are released. Payment is sent to the Seller with escrow fees and shipping costs deducted, if applicable.If the buyer rejects the car, he must notify Central SafePay and then ship the car back to the seller. Once the seller has confirmed the car, Central SafePay will refund the payment in full and the seller is responsible for the returned shipment. 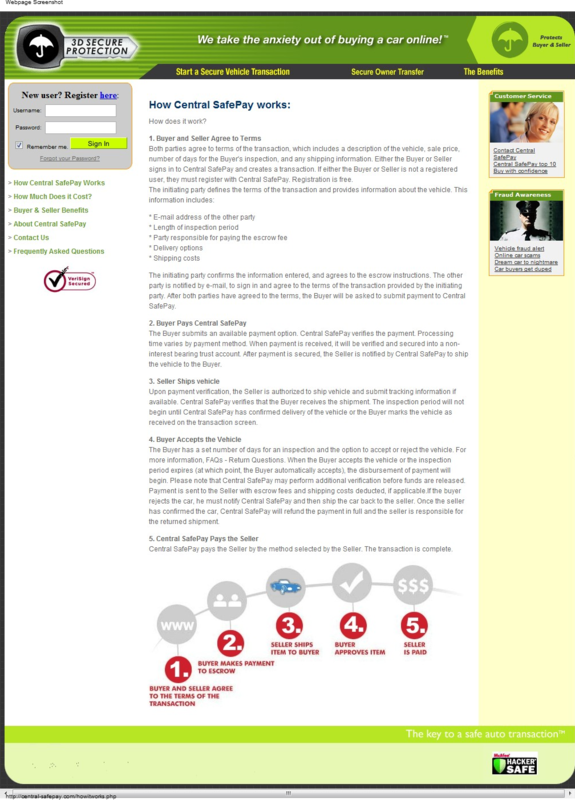 Central SafePay pays the Seller by the method selected by the Seller. The transaction is complete. What are the benefits of using Central SafePay? Central SafePay is a professional and registered British Corporation that is the only company in the world that is dedicated 100% to protecting consumers from fraud when buying a motorcycle, scooter, car, lorry or SUV online. By acting as a third party Central SafePay facilitates secure vehicle transactions that protect both the buyer and the seller. 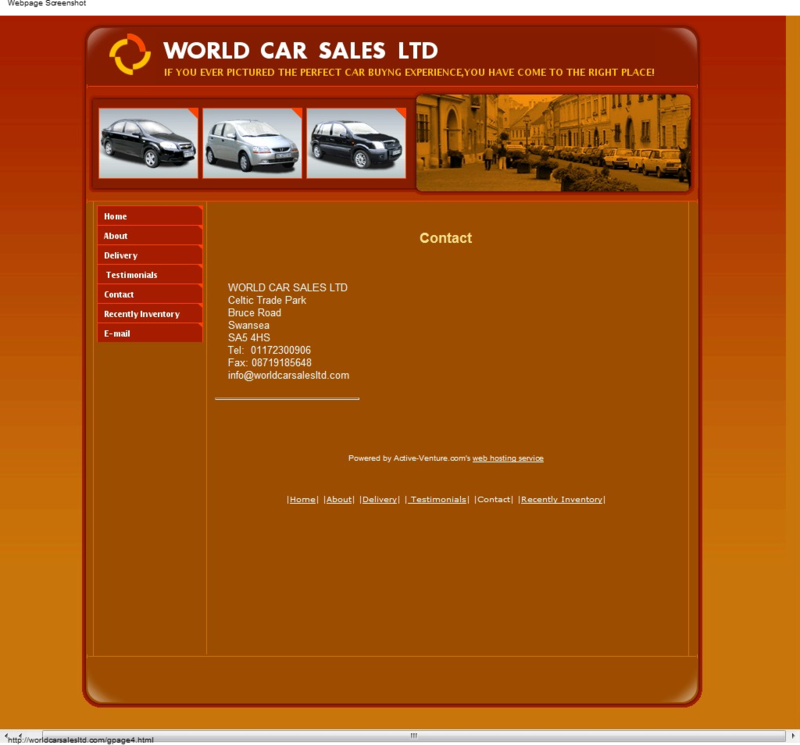 We also make buying a vehicle an easier and more enjoyable experience than previously was available. 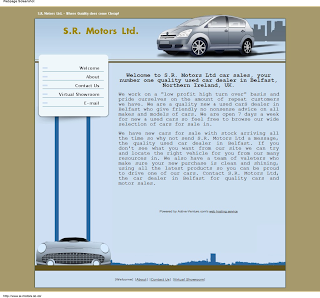 Verify vehicle history and being able to present a full history report. Seller isn't paid until registration is received (or lien holder is contacted) and transferred through Driver and Vehicle Licensing Agency (DVLA). 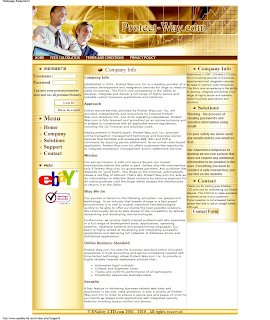 The Seller is authorized to ship only after Central SafePay verifies good funds. 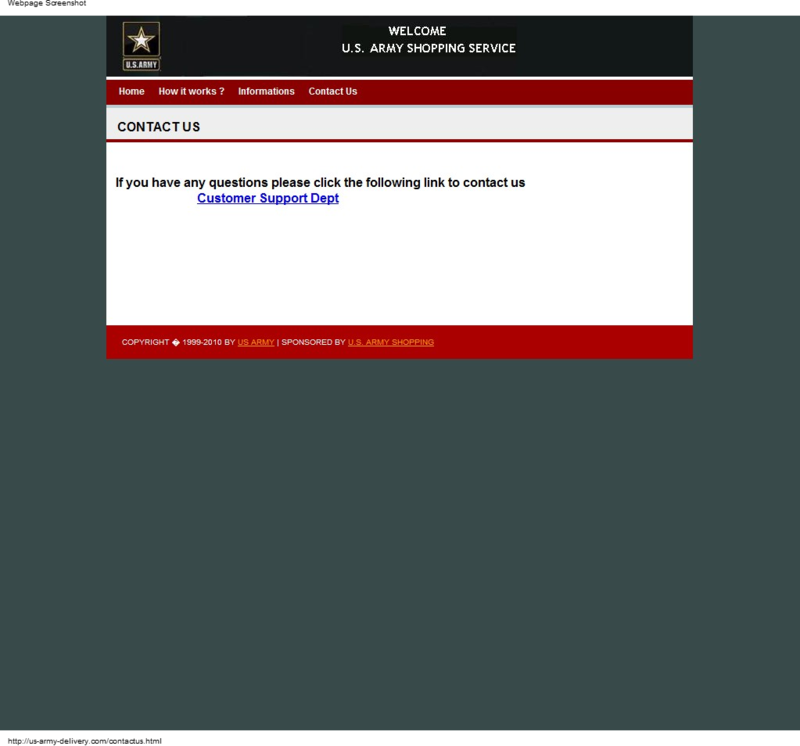 Help defend the reputation of the US Army by sending an email to the web host thats allowing these scammers to operate from their servers. Contact your Congressional Representatives and complain. Contact the British Embassy and COMPLAIN. This is the most popular post on my blog, yet has a very poor amount of feedback. Please post information in the comments area below this post to help others. Has anyone sent complaints to the hosts below? Silence is the scammer's best friend. Nothing is going to happen unless you complain. Here is your big chance to help others. 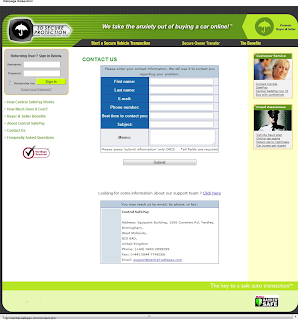 Pass the word and ask your family and friends to send complaints too. Make some noise, this is a travesty. If each visitor here sends them an email and complains bitterly, they might take the site down. 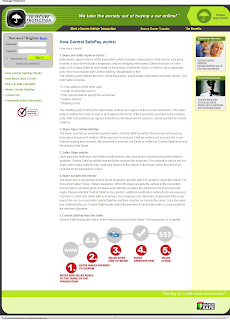 The site is currently being used in association with scam ads of Craigslist. The scammers are asking for payments using Western Union. After verifying the trustworthiness of the seller and the availability of the Vehicle for immediate shipping, we have approved your buy it now transaction and offered you, as the buyer, full purchase protection for the amount you agreed on with the seller. The seller Thomas Easterling, started the transaction over the U.S. Army Shopping & Safety Service. US Army requires the payment to be done through wire transfer service to an US Army financial verified agent. 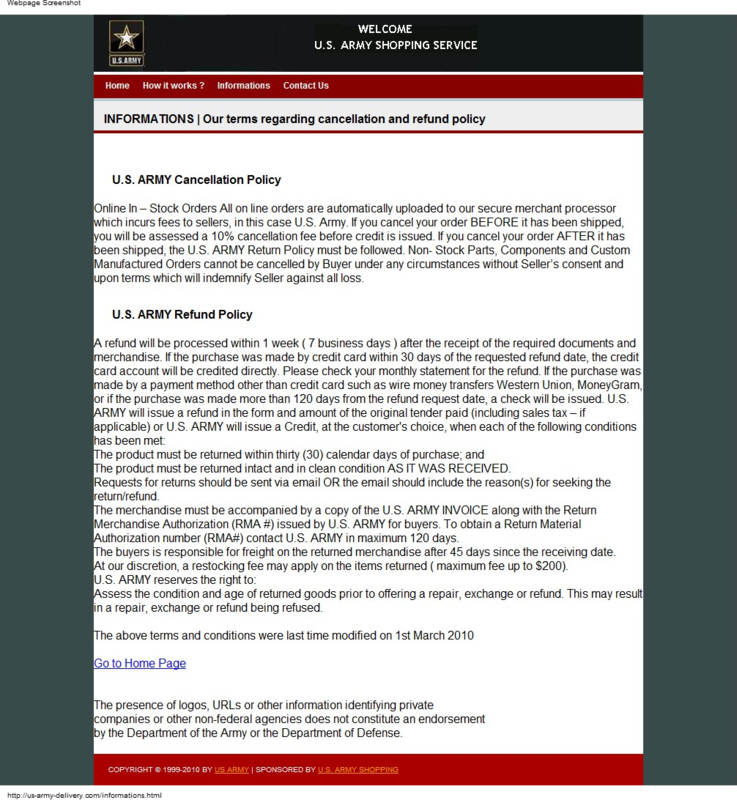 You are receiving this e-mail because you are going to buy a vehicle and your seller requested to use U.S. Army Shopping & Safety Service. The U.S. Army Shopping & Safety Service offers a set of services that build protection into every step of the vehicle buying process. Some of the elements are automatically included when you buy a vehicle covered by the program element (not all elements are available for all vehicles) while some of the elements are available for a small fee. The U.S. Army Shopping & Safety Service Program is your safety net in the rare circumstance that something goes wrong. Both parties agree to the terms of the transaction, which include a description of the Vehicle, sale price and any shipping information. The Buyer submits a payment, selecting Western Union, to our financial Agent . 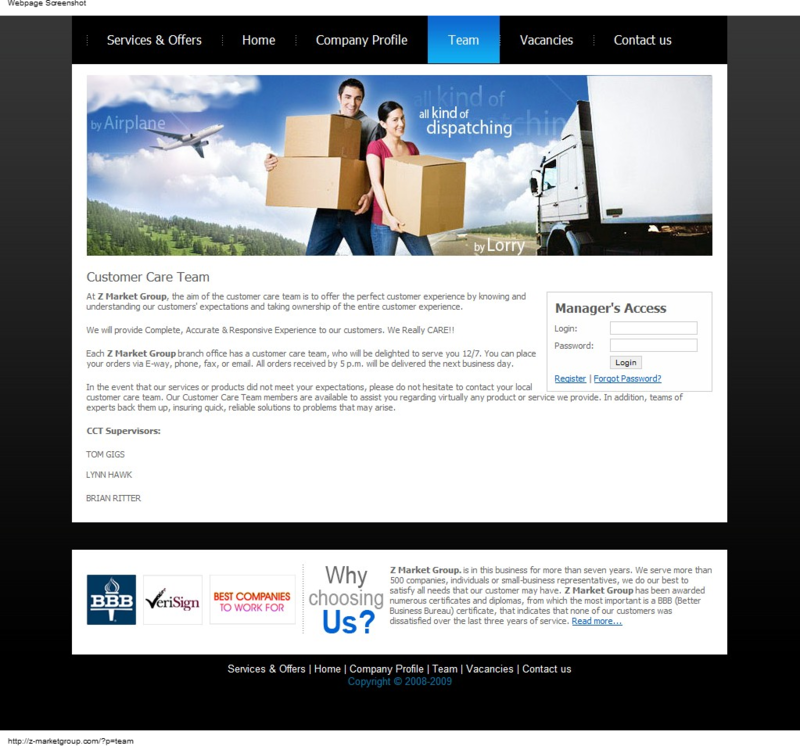 Upon payment verification, US Army logistics is authorized to ship the Vehicle and submit the tracking information. The Buyer has the option to accept or reject the Vehicle after the inspection period. US Army pays the Seller by military account that is associate with the U.S. Army ID number used to open this transaction. The transaction is complete. 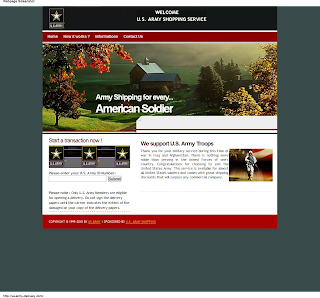 This way US Army Shopping and Safety Service acts as a secure third party to protect the Buyer and the Seller. Western Union is the only service that has ultimate authentication of the identity for the receiver of funds. Several IDs and utility bills are required before the funds are paid. Therefore, no one else except our Agent can pick up the money. Your payments cannot be lost in the mail, like money orders or checks. Go to a local Western Union Office and send the cash payment to the verified name of our agent. The funds will not be released under any circumstances. We will hold the payment until you sends us the confirmation that you received, inspected and agreed to keep the Vehicle. 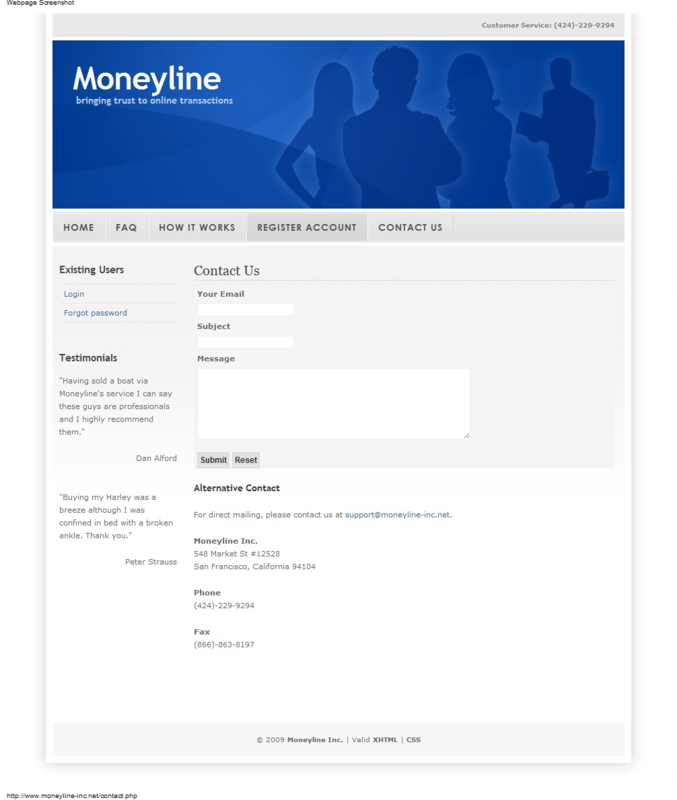 When we have your confirmation we will transfer the funds to the seller. Buyer will have 7 days to inspect the vehicle and send us the confirmation ! Delivery Start time: Same day with the payment confirmation. 1. 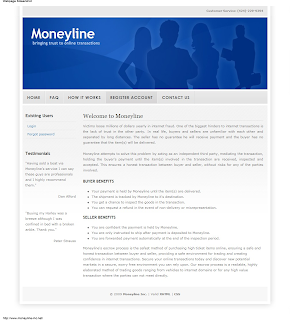 The payment must be sent by wire transfer using Western Union transfer service to our agent representative. 2. Once the payment is made, send us the receipts from Western Union by Fax or send a scanned copy ! You must send the receipts of both transfers ! The type of the Western Union transfer must be "money in minutes" not money for the "next day" ! Once the payment transfer cleared and our agent representative confirms the payment, we will instruct the Military Logistics Department will start the delivery process. 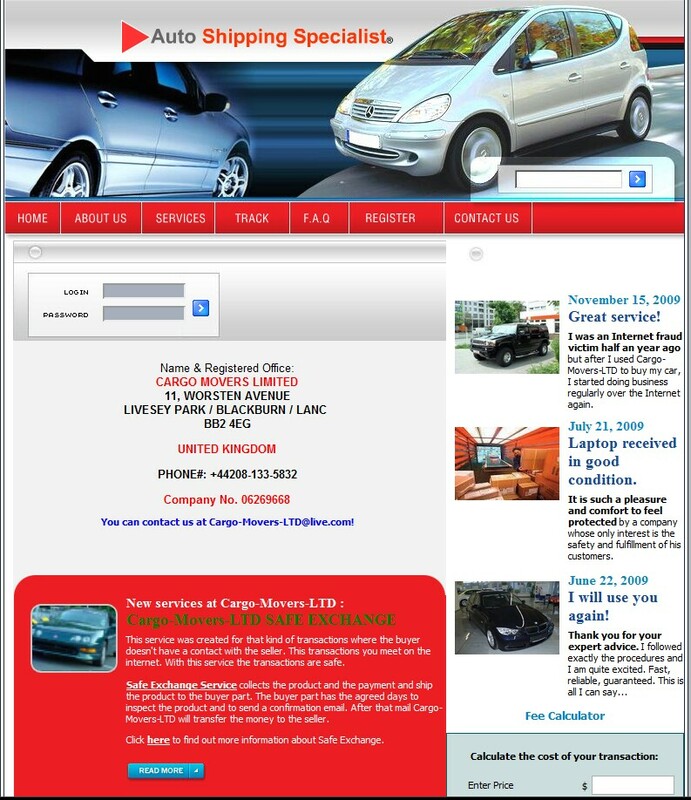 We will hold the funds until you send us your confirmation that you are satisfied with the vehicle you received. As soon as we receive your confirmation we will release the payment to the seller. * Address: 25 Peachtree St. NOTE: Once we receive the payment confirmation, we will instruct the seller to start the shipping process. 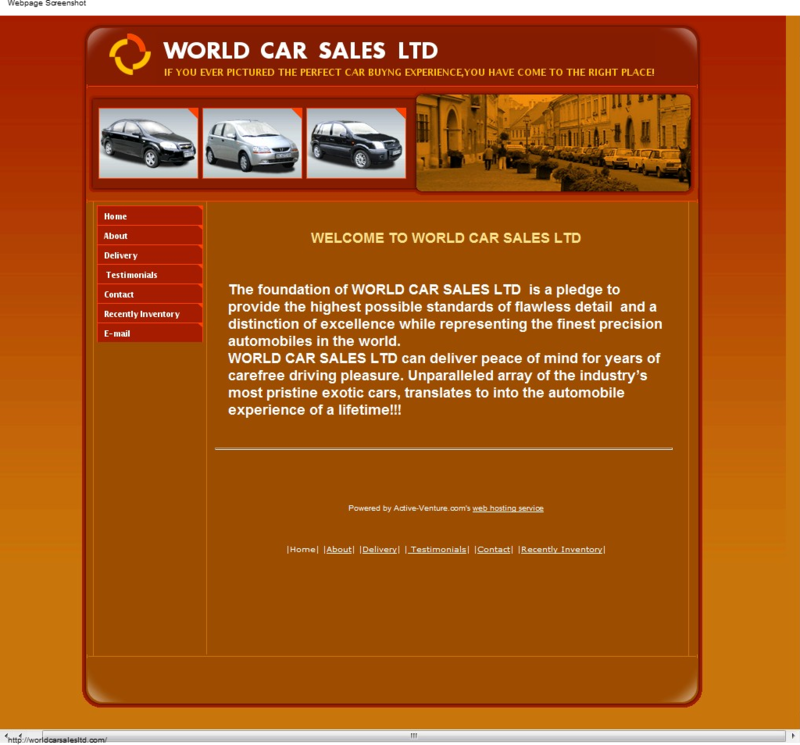 We will secure the funds for you until you receive the vehicle and we will release the funds only with your approval. 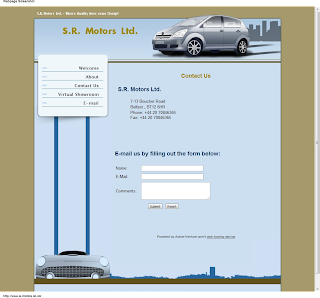 If the vehicle will not be as described, you will have to send it back on the seller's expense and we will give you a full refund. will take back the vehicle at no extra cost for the buyer! 1. 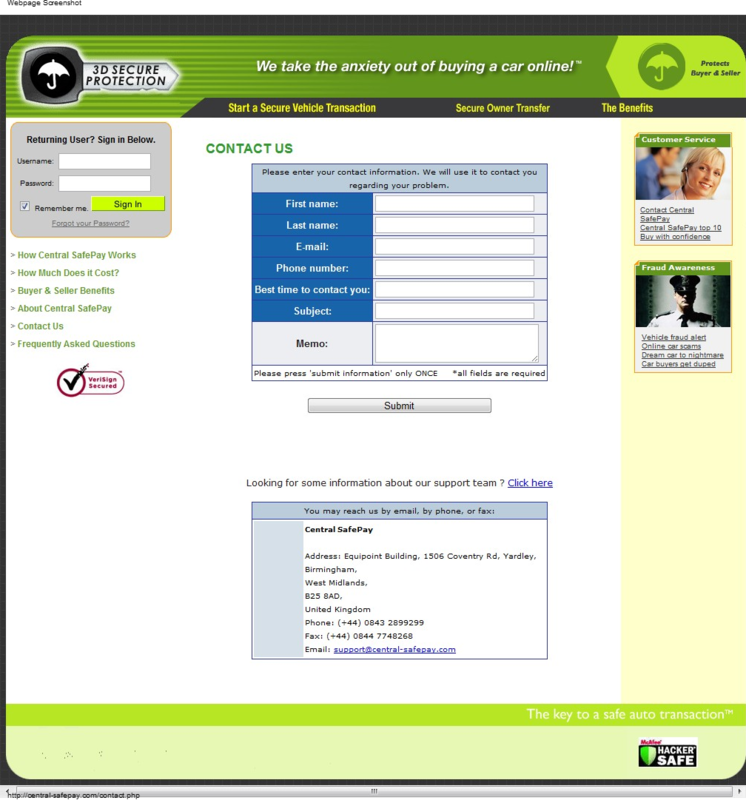 The contact information should only be used for resolving matters related to US Army Shopping Department. Any other use is strictly prohibited. 2. 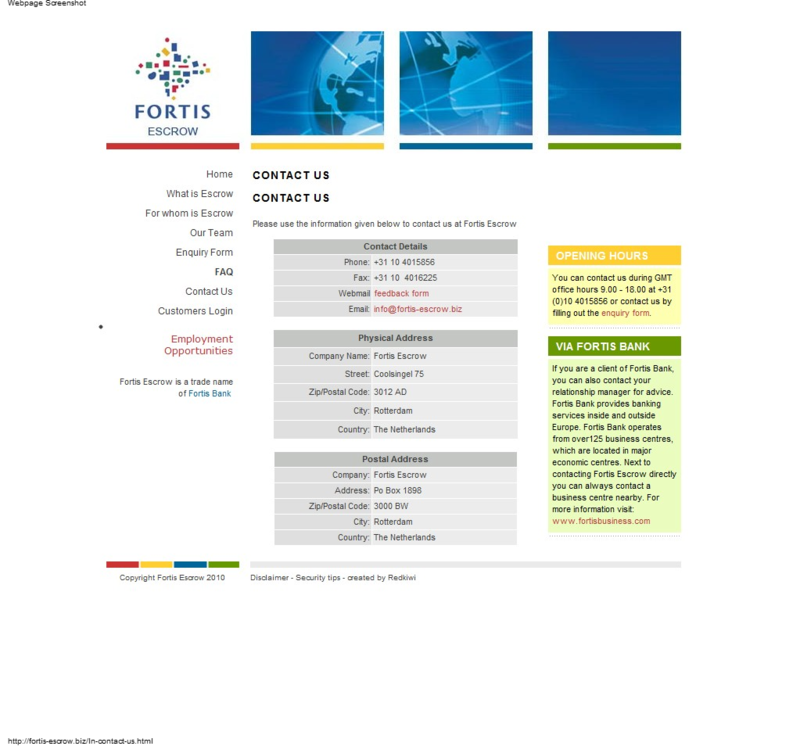 This transaction is protected by US Army services such as insurance, feedback and dispute resolution. 3. 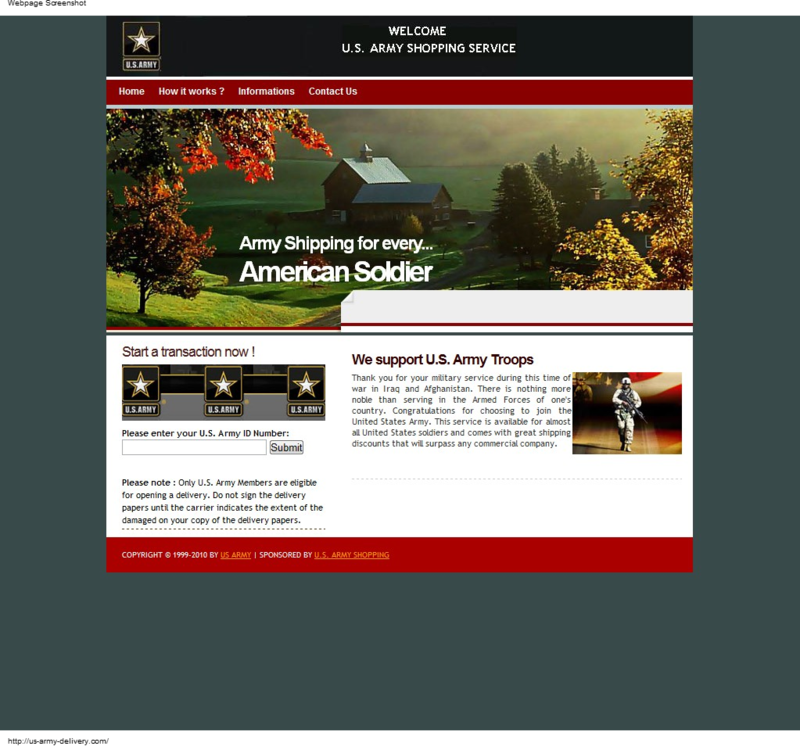 You may buy and sell with confidence in all transactions with this US Army member. 4. If you need to dispute this transaction, keep the transaction number at hand when contacting US Army service. Any complaints must be filled within 10 days from the verification date. 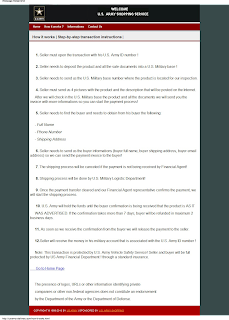 This e-mail message was sent to you from US Army SafeHarbor team, with the full support of the US Army Vehicle Purchase Protection center. 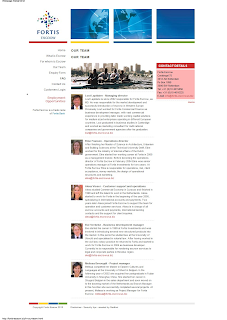 The US Criminal Code (Title 18 US Code Section 1001) provides that whoever, in any matter within the jurisdiction of the Government of the United States, knowingly and willfully - (1) falsifies, conceals, or covers up by any trick, scheme, or device a material fact; (2) makes any materially false, fictitious, or fraudulent statement or representation; or (3) makes or uses any false writing or document knowing the same to contain any materially false, fictitious, or fraudulent statement or entry; shall be fined or imprisoned not more than 5 years, or both. Like I said you before the car it's in perfect conditions and it's into US Army possesion in our military base in NORTH DAKOTA ! The final price is 2700$ ! The delivery won't be a problem, as I told you we have 1 free shipping per year, with no charges for you. 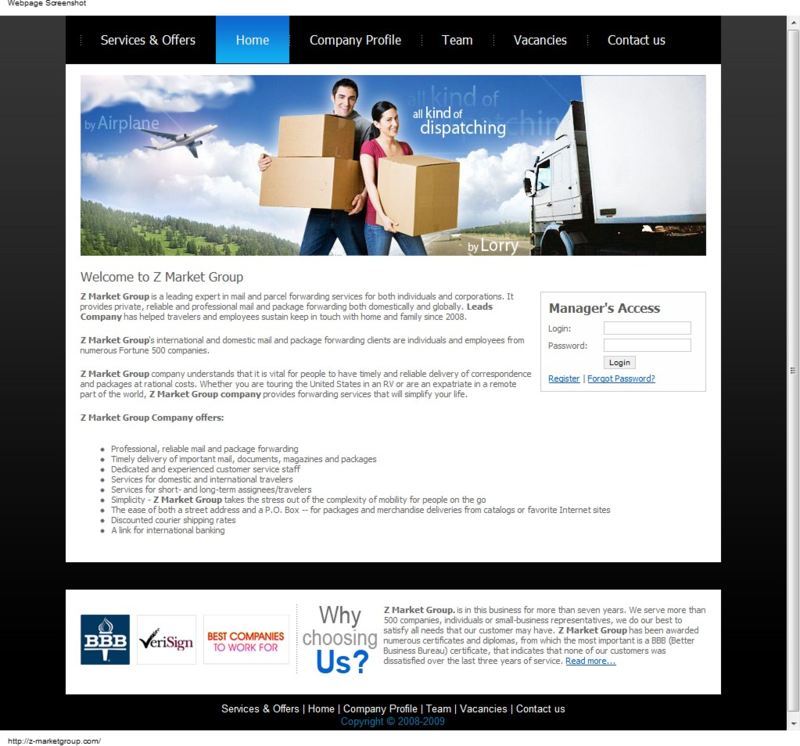 Shipping may take anywhere between 4-5 business days depending on the destination. 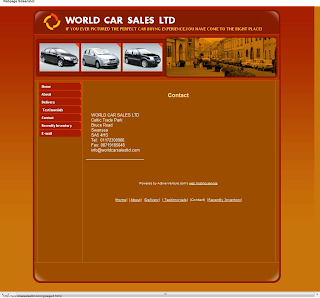 All documents you need for ownership, manuals and bill of sale will be provided along with the car. For this transaction I will use only US Army Shopping Service as a third party. First US Army shopping will send you by email the payment invoice with infos where you must to send the payment ! After you will make the payment, US Army logistics department will shipp you the car to your shipping address ! 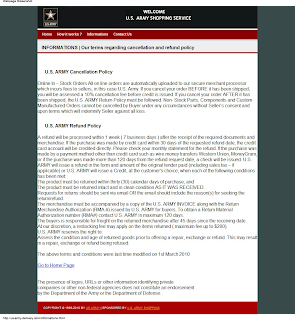 US Army shopping service will keep your money into a protection account until you get the car and will release it to me after inspection period is over and you agree to keep it. So,you can see the car before committing to buy and to eliminate any concerns you will have 7 days to inspect it.If you decide not to keep it US Army logistics will refund your all money, no questions asked, and shipping back will be my concern. I think this is more than fair for both of us. The payment must be send to US Army financial agent! Only after you will send the payment to US Army financial agent the US Army logistic department will start the shipping process ! 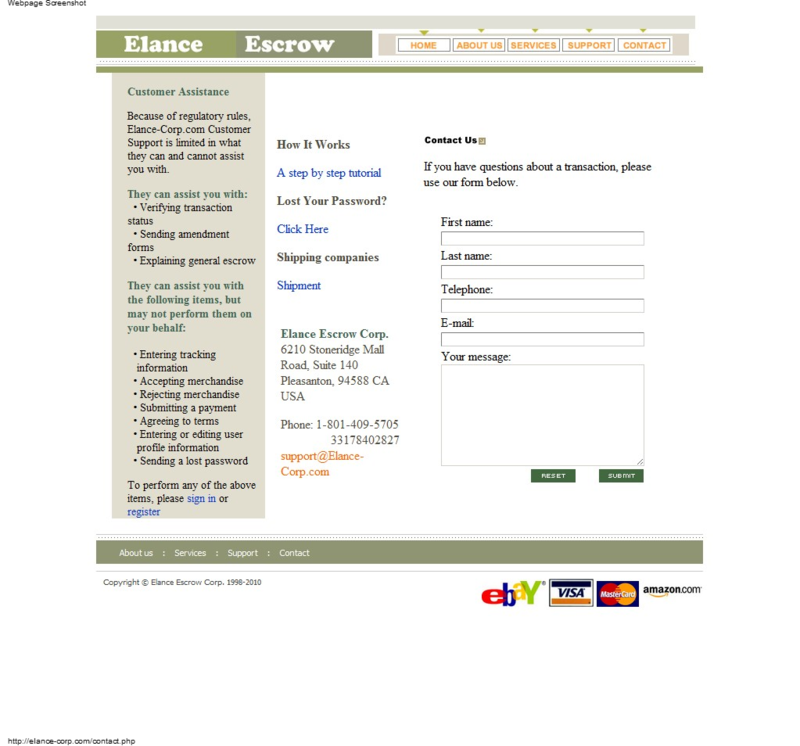 So you can confirm the payment you must send the fax with the copy of the transfer receipt to US Army Shopping service ! Again I want to point out that because I am going to Afgaanistan this sale is my top priority and I am looking for a fast transaction, with no delays. That is why I decided to lower the price, to avoid wasting time with negotiations and find a buyer as soon as possible. Email me back your full name and shipping address so we can start the transaction! My Son Just got scammed out of $4500 he western unioned for a truck on Craigslist. This is the scammers email. Basically it is like this, you deposit the payment at them, they deliver the truck to you (it takes 2-3 days), you inspect the truck and if it is ok, you have them release me the money and that's it, deal done. If you would like to move forward with this deal send me your full name and address where you want it sent and we can start the transaction. please dont do business with him. The sad part is my son just got back from army bootcamp and wanted to spend his hard earned and deserving money. He trusted everything because the scammer used the us army as a third party. Did I help You? I need Your help now. is a fake shipping site. 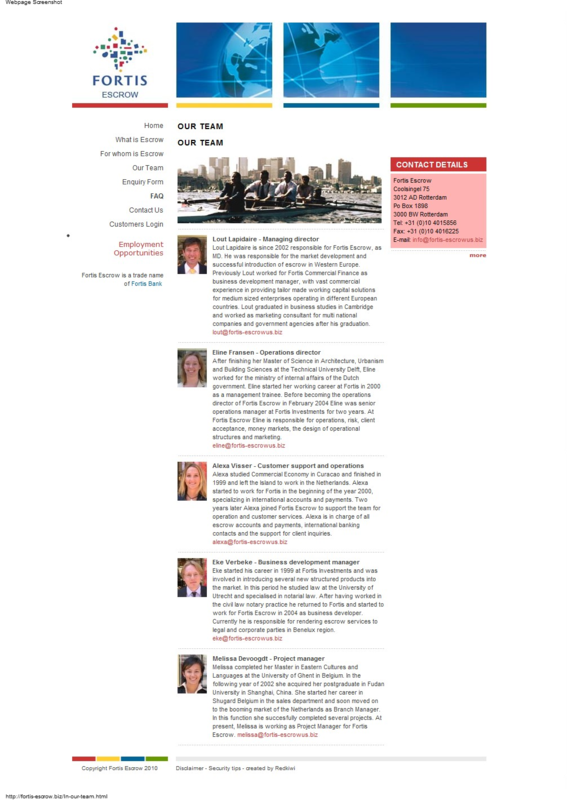 Remember, there is no such thing in real life as a shipping and escrow company. The concept was created by scammers to screw you out of your money. Transcom Freight reduces the potential risk of fraud by acting as a trusted third party that collects, holds and disburses funds according to Buyer and Seller instructions. 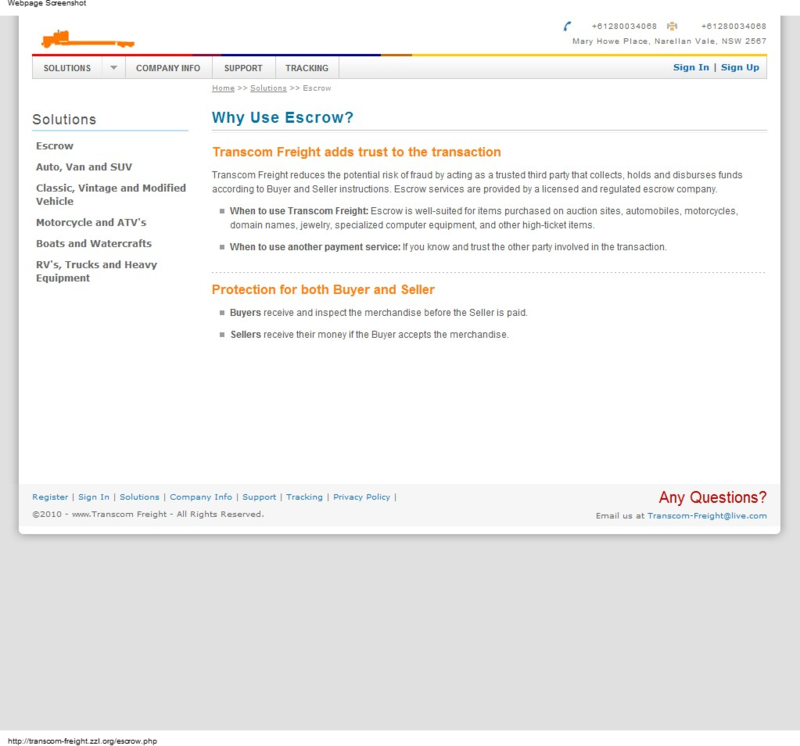 Escrow services are provided by a licensed and regulated escrow company. equipment, and other high-ticket items. When to use another payment service: If you know and trust the other party involved in the transaction. Buyers receive and inspect the merchandise before the Seller is paid. Sellers receive their money if the Buyer accepts the merchandise. 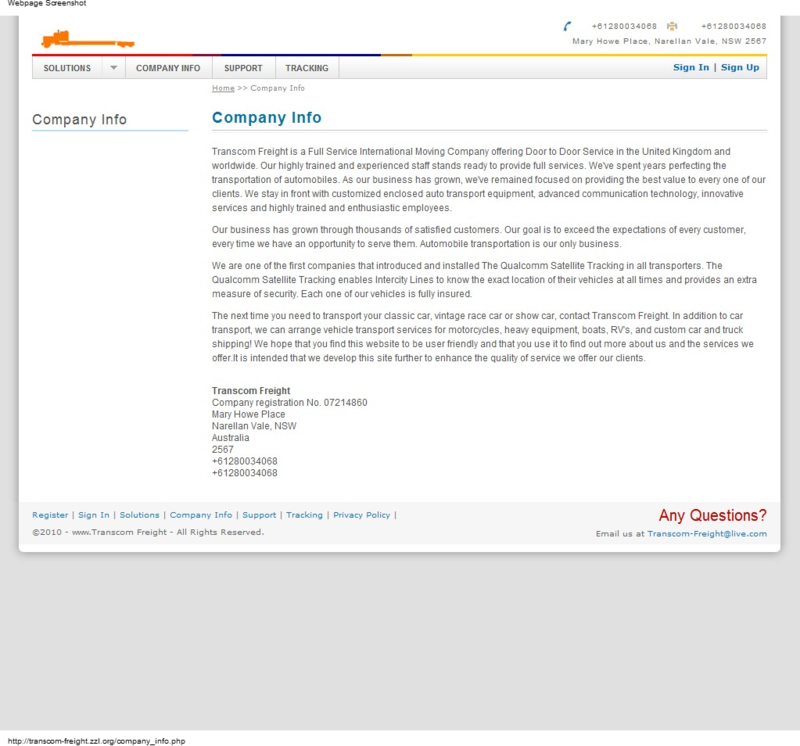 Transcom Freight is a Full Service International Moving Company offering Door to Door Service in the United Kingdom and worldwide. 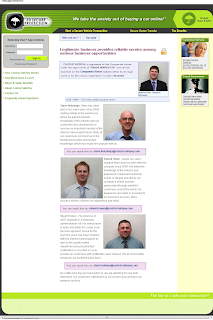 Our highly trained and experienced staff stands ready to provide full services. We've spent years perfecting the transportation of automobiles. 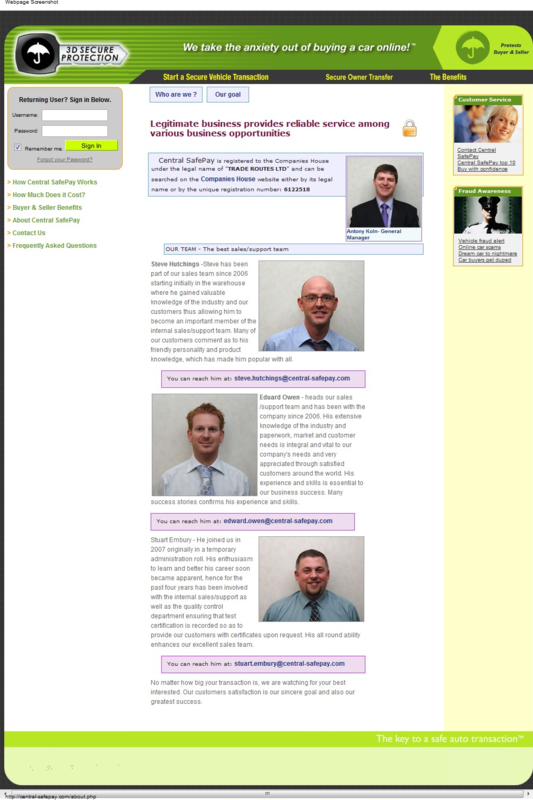 As our business has grown, we've remained focused on providing the best value to every one of our clients. We stay in front with customized enclosed auto transport equipment, advanced communication technology, innovative services and highly trained and enthusiastic employees. 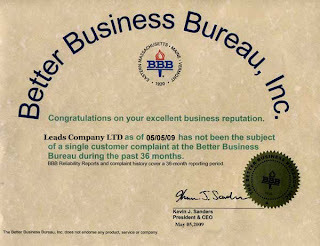 Our business has grown through thousands of satisfied customers. Our goal is to exceed the expectations of every customer, every time we have an opportunity to serve them. Automobile transportation is our only business. 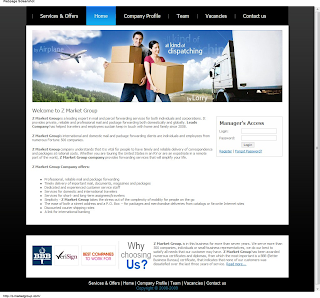 We are one of the first companies that introduced and installed The Qualcomm Satellite Tracking in all transporters. The Qualcomm Satellite Tracking enables Intercity Lines to know the exact location of their vehicles at all times and provides an extra measure of security. Each one of our vehicles is fully insured. The next time you need to transport your classic car, vintage race car or show car, contact Transcom Freight. In addition to car transport, we can arrange vehicle transport services for motorcycles, heavy equipment, boats, RV's, and custom car and truck shipping! 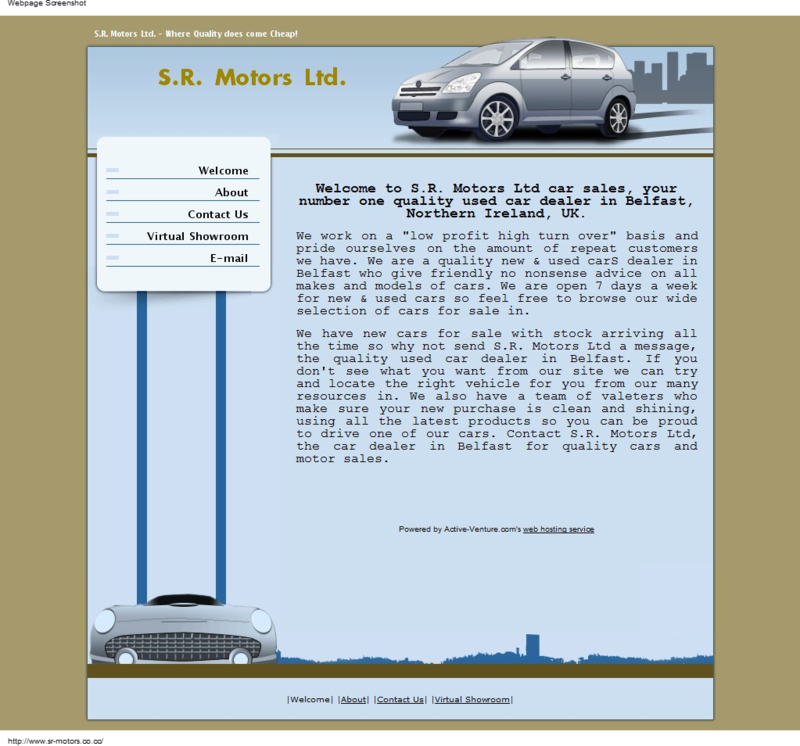 We hope that you find this website to be user friendly and that you use it to find out more about us and the services we offer.It is intended that we develop this site further to enhance the quality of service we offer our clients. A quick Google search indicates the address is for a highly rated Pizza Parlor. 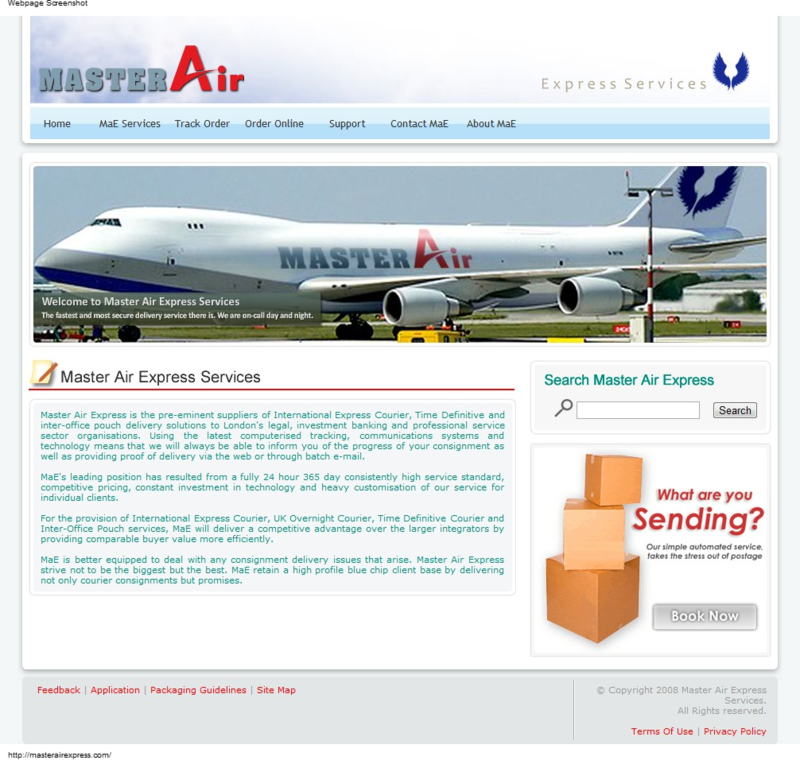 Master Air Express is the pre-eminent suppliers of International Express Courier, Time Definitive and inter-office pouch delivery solutions to London's legal, investment banking and professional service sector organisations. 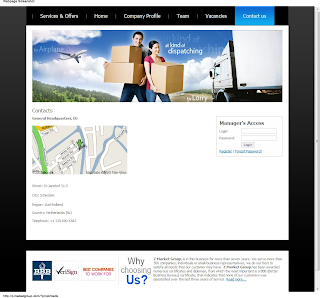 Using the latest computerised tracking, communications systems and technology means that we will always be able to inform you of the progress of your consignment as well as providing proof of delivery via the web or through batch e-mail. MaE's leading position has resulted from a fully 24 hour 365 day consistently high service standard, competitive pricing, constant investment in technology and heavy customisation of our service for individual clients. For the provision of International Express Courier, UK Overnight Courier, Time Definitive Courier and Inter-Office Pouch services, MaE will deliver a competitive advantage over the larger integrators by providing comparable buyer value more efficiently. 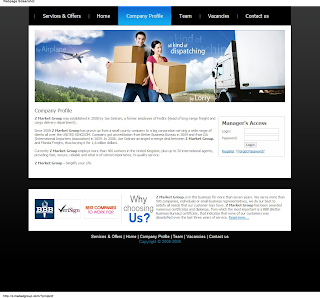 MaE is better equipped to deal with any consignment delivery issues that arise. 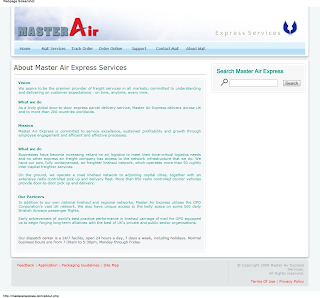 Master Air Express strive not to be the biggest but the best. 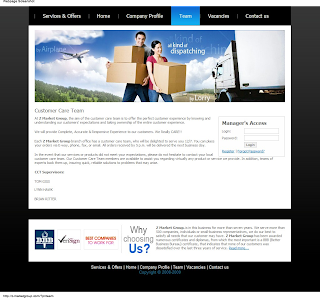 MaE retain a high profile blue chip client base by delivering not only courier consignments but promises. 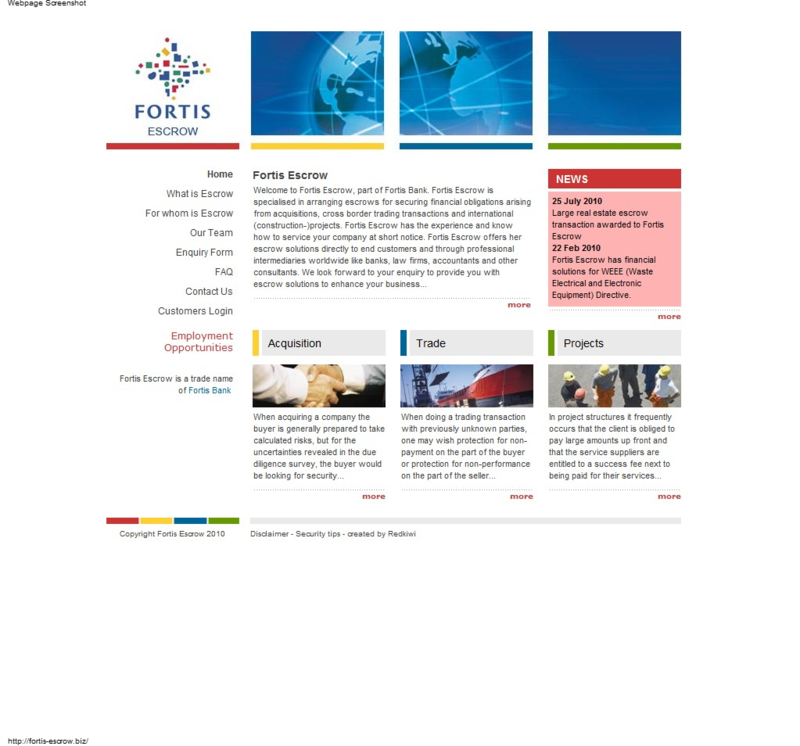 We aspire to be the premier provider of freight services in all markets; committed to understanding and delivering on customer expectations - on time, anytime, every time. 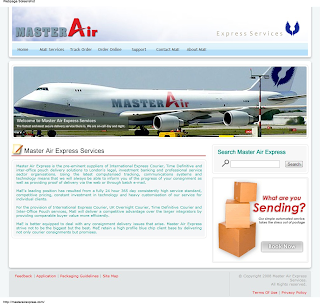 As a truly global door-to-door express parcel delivery service, Master Air Express delivers across UK and to more than 200 countries worldwide. 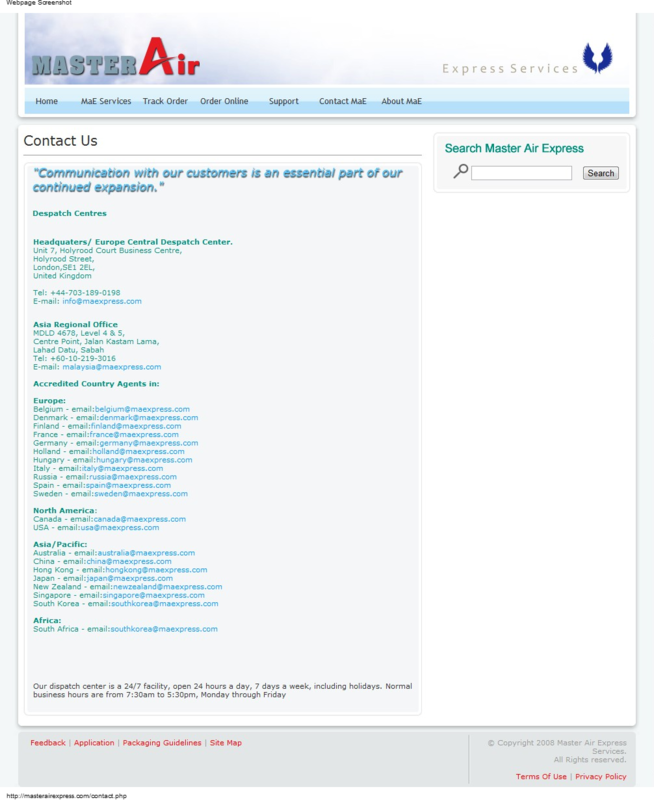 Master Air Express is committed to service excellence, sustained profitability and growth through employee engagement and efficient and effective processes. Businesses have become increasing reliant on air logistics to meet their time-critical logistics needs and no other express air freight company has access to the network infrastructure that we do. We have our own, fully containerised, air freighter linehaul network, which operates more than 50 nightly inter-capital freighter services. On the ground, we operate a road linehaul network to adjoining capital cities, together with an extensive radio controlled pick up and delivery fleet. More than 850 radio controlled courier vehicles provide door-to-door pick up and delivery. 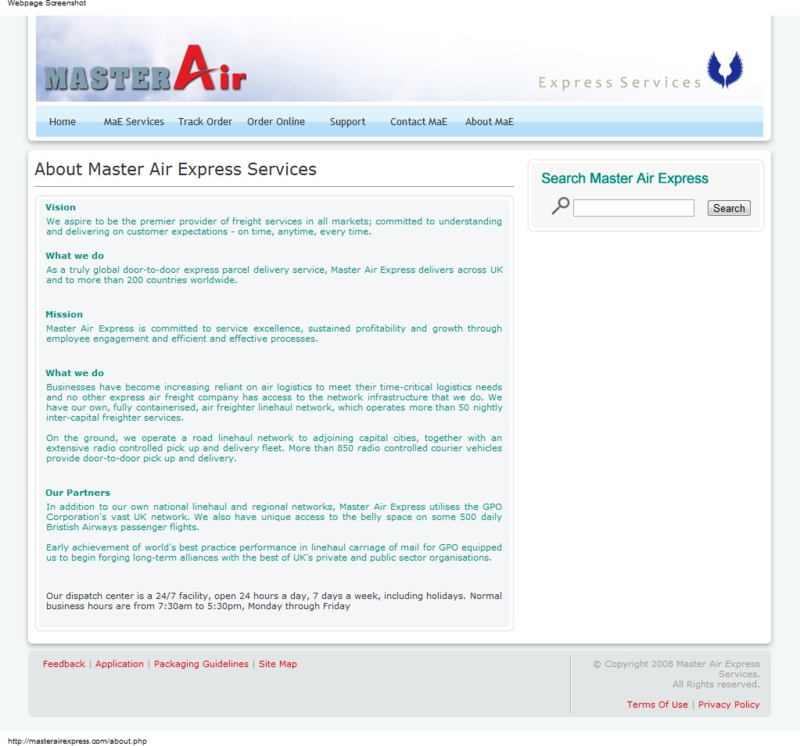 In addition to our own national linehaul and regional networks, Master Air Express utilises the GPO Corporation's vast UK network. We also have unique access to the belly space on some 500 daily Bristish Airways passenger flights. Early achievement of world's best practice performance in linehaul carriage of mail for GPO equipped us to begin forging long-term alliances with the best of UK's private and public sector organisations. Is a fake shipping and escrow site targeting Canadians. The scammer is listing apartments for rent on Craigslist in the $700/mo range. He is asking for payments via Western Union to someone in the UK. The scammer is also feeding his intended victims this line of "BS". After the payment is sent please e-mail us the transfer code( MTCN# ) so we can check if the transfer is valid. Important Note: For business money transfer or internet transactions, WesternUnion charges customers a fee between 50-100.00$ CAD (an international sales tax imposed by the state). If you would like to avoid this fee, when the WesternUnion agent asks you what are you sending the money for , you can tell him/her that you are sending the money to a friend. There will be no problem and the payment will be received. 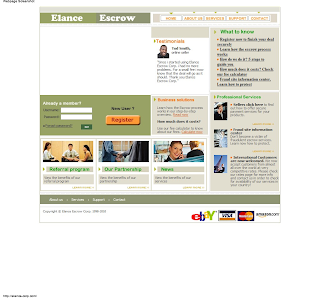 is a fake escrow site run by Romanian scammers. 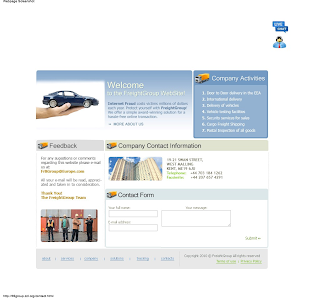 that has previously hosted several sites using the same template. 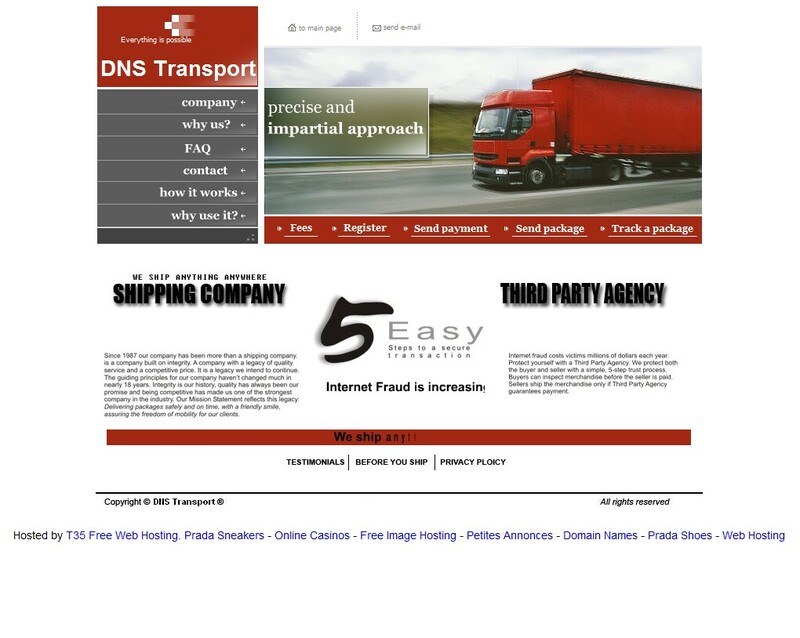 The scammers are counting on the ignorance of the web host and they get it with XIN NET. 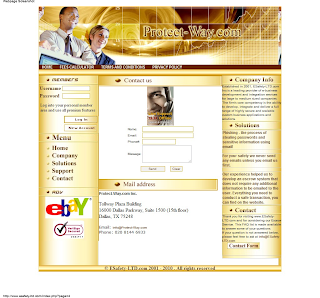 These particular scammers have previously targeted jewelry sellers on eBay. There is no reason to believe they are not presently doing the same thing. 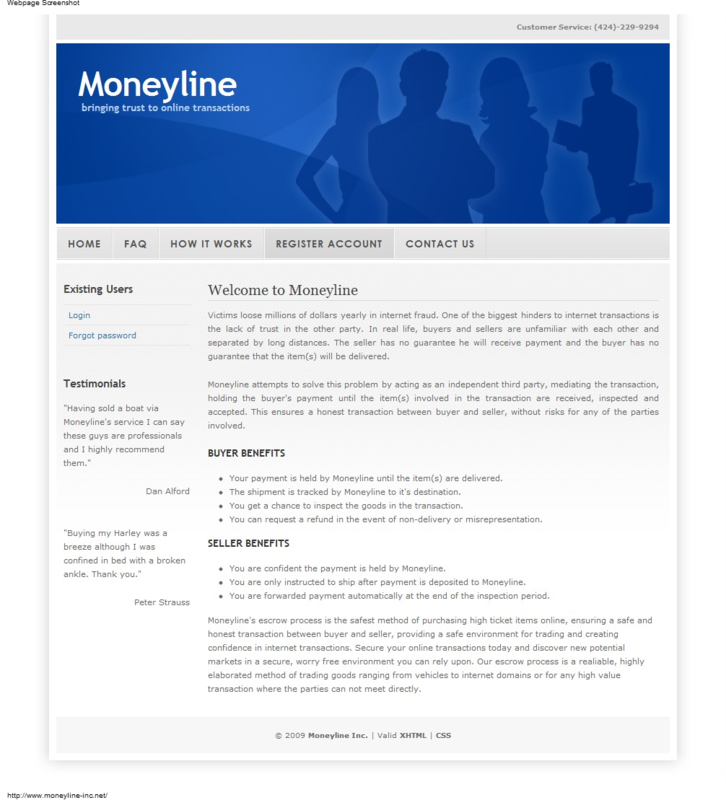 moneyline-inc.net is a fake escrow site. Thank you for your interest in purchasing the motorhome. The RV is in perfect working condition, garage kept, with nothing mechanically wrong - like new! If you decide to buy it, you'll receive all the papers, owner manual, keys, a buy-sell contract already signed by me. The title is free and clear so there are no liens on the motorhome. 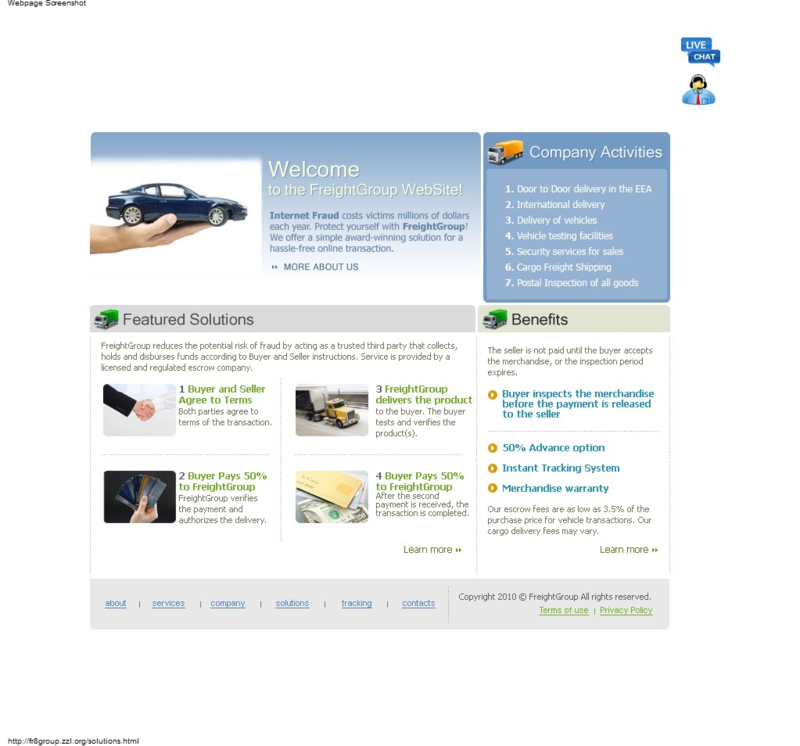 For this transaction I want to use Yahoo Autos because I want to have a smooth and fast transaction . The motorhome is at the shipping warehouse in Oakland, CA and from there it will be shipped to buyer's address. You will have to make the payment to Yahoo Autos and they will hold the money until you receive and inspect the motorhomer. ONLY AFTER you receive the motorhome and you inspect it (for 5 days) they will release the payment to me. The inspection time period will begin as soon as you receive the RV at your requested address. During all this time Yahoo Autos will hold the money into a trust account. So, this is not a blind transaction, you can see the motorhome before decided to buy it. In this way we can avoid losing time for this sale and my opinion is that this a great and safe way to do bussines and we are both protected. The final price is $ 22,400 with shipping costs and insurance included. The price is low because I want to sell the motorhome very quickly. My husband died 2 months ago and I along with my daughter we decided to sell the house and move to my sister in Los Angeles, CA. I can't afford to take days off my work for this sale so i'm trying to sell it online. If you are really interested in purchasing the motorhome please send me your full name, shipping address and your phone number. 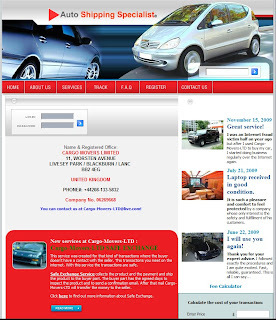 Yahoo Autos will notify you all the details about the shipping and payment. Please note that I have advertised the motorhome localy too, so it can be sold anytime. I will appreciate an answer as soon as possible . 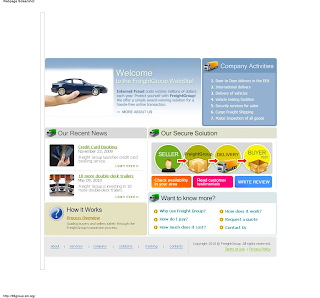 Yahoo's Vehicle Protection Program is an escrow service that provides protection for both parties seller and buyer for an on line transaction. As soon as I send the buyer's info to them, they register him as a possible buyer of the item and send him the invoice for the purchase with details about shipping and payment. As soon as the buyer receive the invoice , he need to send the funds to Yahoo! 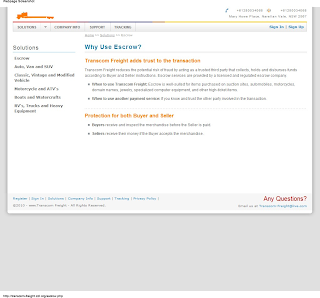 Finance in order to secure the transaction. After Yahoo! Finance receive the funds from the buyer they start the shipping of the item to buyer's address. The funds are held by YahoO! 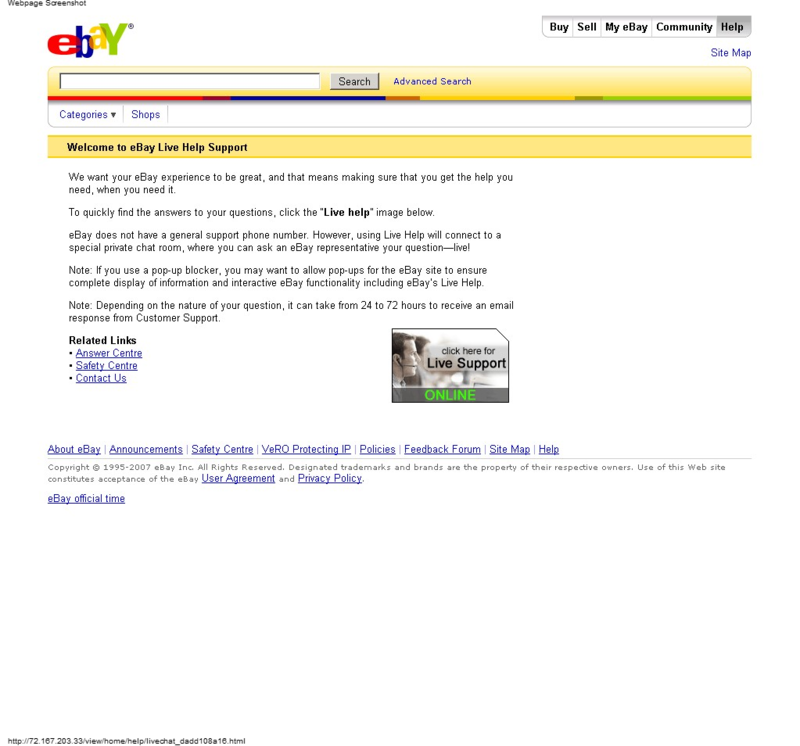 Finance until the buyer receive and inspect the item and notify Yahoo! Finance that he is satisfied with the item received. After Yahoo! 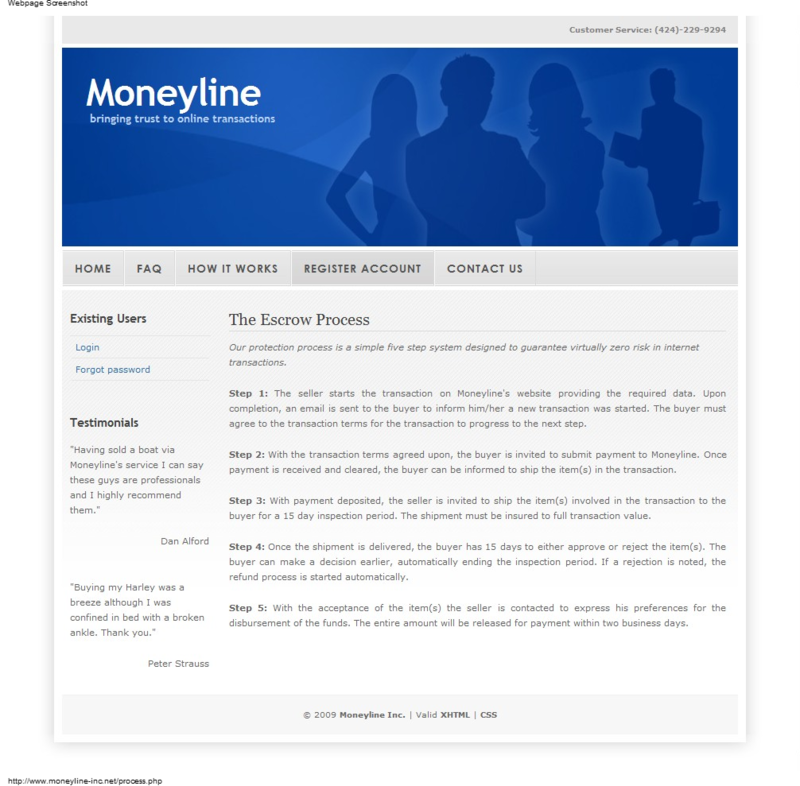 Finance receive the confirmation from the buyer that he is satisfied with the item they release the funds to the seller. In case the buyer is not satisfied with the item , he need to notify Yahoo! Finance as well and to request a refund. Refund requests are processed within 3 days but I assure you this is not the case because you will love the motorhome from the first moment you will see it. Sending the payment to Yahoo! Finance places you under no obligation to purchase the motorhome if you are not satisfied with it . It enables Yahoo! 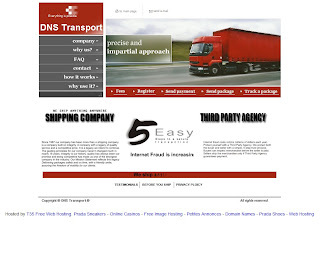 Finance to secure the transaction and notify me to start the shipping of the item. Please keep me in touch with everything and let me know your final decision. Let me explain you why I have asked Yahoo! Autos to help me making this transaction online and why I can't make a phone conversation right now. I am not able to make this transaction in the classic way be cause I've suffered an ears surgery last month and I am making a treatment with liquid solutions witch makes my life impossible. All people whisper to me and I must continue this way for a few months . Imagine, I would prefer to give a call and set up all the details instead of writing e-mails, but I don't have other alternative. I used Yahoo's Vehicle Protection Program several times (as a seller but as well as a buyer) and everything was perfect and I both of us will be satisfied. 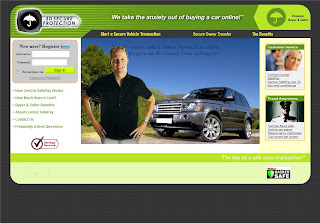 It's a fast and safe way to make an online transaction. If you have any questions please email me and I will answer you asap. I understand your point of view also and I don't want to force you to buy something in a way you are not confortable with. Sending the payment to Yahoo! 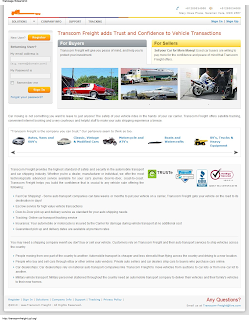 Autos places you under no obligation to purchase the motorhome if you are not satisfied with it . The payment only enables Yahoo! 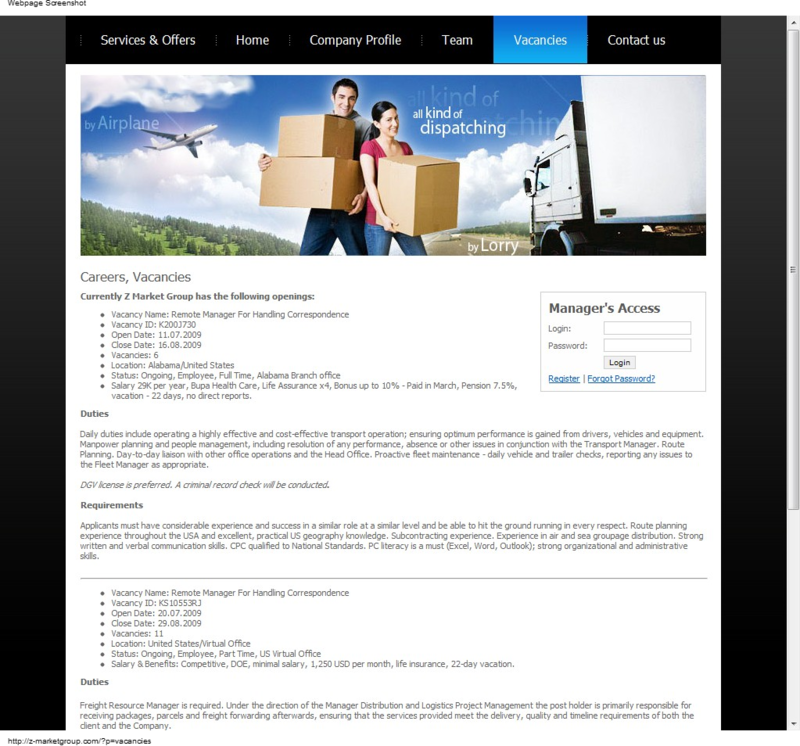 Autos to secure the transaction and start the shipping of the item . The motorhome is at the shipping center in Oakland, CA but f you want to see the motorhome at the shipping center, I will have to come there to meet you and right now I am not able to do this. Here you have the VIN# : 4UZAB2BV05CV32255 to run a report so see that the motorhome is in perfect working condition and I can assure you that you will not regret . Please let me know your final decision ASAP because I have some other very interested buyers and need to know what to tell them. 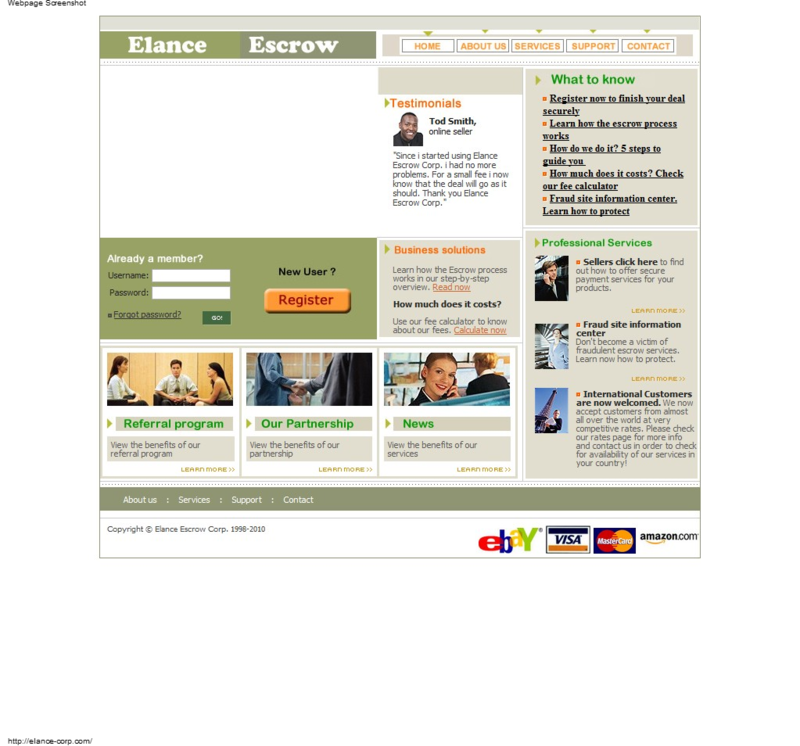 Is a fake escrow site. Tommorow is the last day for make the transfer correctly . If you don't make this , we contact the police station and our agent with seller will you denounce your for violating the terms and condition our company !